What do you mean by comparative essay? That the assignment or the essay write up should not be too formative and straight forward but it should come up with a basis for the comparison which would make it look more subtle and natural. It should be providing by the essay question itself. The essay question should be considered well in advance and the basis of comparison should be cleared out in advance. The main thesis should be developed by the writer himself to make it more original as the question which may simply be asked will make it compare the two arcs. As a result, the writer has to develop a basis for comparison, by a basis it means, a theme, concern, or device common to both works from which you can draw similarities and differences. The writer should develop a list which will state the similarities as well as the differences in the two subjects. Once the comparison and the basis of it is clearly mentioned, the next important step is to make valid pointers in the sense of differences and similarities between the two subjects and then comparing them, analyzing them and studying them. 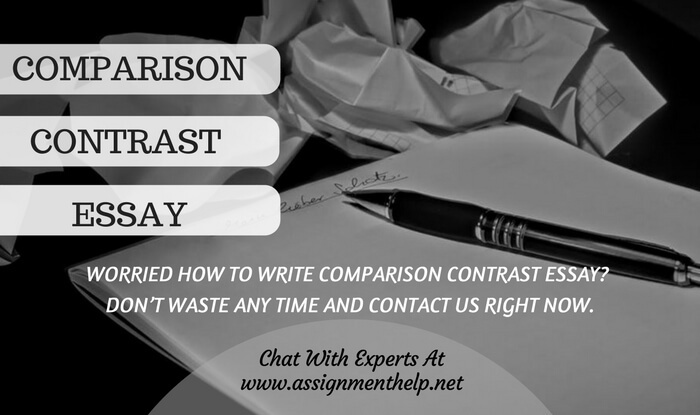 The comparison difference and similarities list which you have drawn up is not the only outline of your comparative essay and should also provide with pointers which would help in making the initial body structure of the essay. Our services are the best that you are going to find on the Internet. We provide the best work by our highly professional tutors who are high degree holders, and the services are also provided at an affordable price. We also assure the best grades for the students in their classes and also provide with notes for the exams on the respective subject. Don’t waste any time and contact us right now. What are the different kind of comparison essay structures and their methods? This is the most used type of method for the construction of the essay. In this method, the related points are found in common for the central subjects which are assumed as A and B. The differences and similarities between the two subjects are drawn out point by point making room for each other. This following mode of method will result in the making of 5 equivalent paragraphs for the essay. In those paragraphs, the comparisons and contrasting should be don consecutively. The subject of this should be the introduction of your state and your thesis, after that the discussion of both the subjects together as one unit and each point of contrast and comparison. In the last conclusion, the main restating of the thesis and after that shortly summarizing the essay for the preciseness. In the end, restate all the thesis and summarize what we learnt from the essay. Comparative contrast essay writing is a very hectic and very structured work. There are many things to be kept in mind while writing this type of essay. Due to so much of this, the students get confused easily and as a result are not able to complete their assignments and projects which are assigned to them on the subject of comparative essay writing by the teachers. But, from now on, the students don’t have to worry anymore because we are here to assist you with your comparative essay writings and assignments. We provide the best work that you can find and also at a very affordable price. We provide with the best tutors who will look after the work for you. Our tutors guarantee top notch work which is 100% plagiarism free and also completed within the time period. Contact us right now on our helpline number or just visit our website assignmenthelp.net to know more about the amazing offers. Contact us at first.